VMfitness: Quest Bar Pumpkin Muffin Pies & High Protein, Natural, Low Calorie Halo Top Creamery Ice Cream Review! Quest Bar Pumpkin Muffin Pies & High Protein, Natural, Low Calorie Halo Top Creamery Ice Cream Review! MMMM I love making QUEST BAR CREATIONS! The bars are so easy and versatile, you can make them into anything! 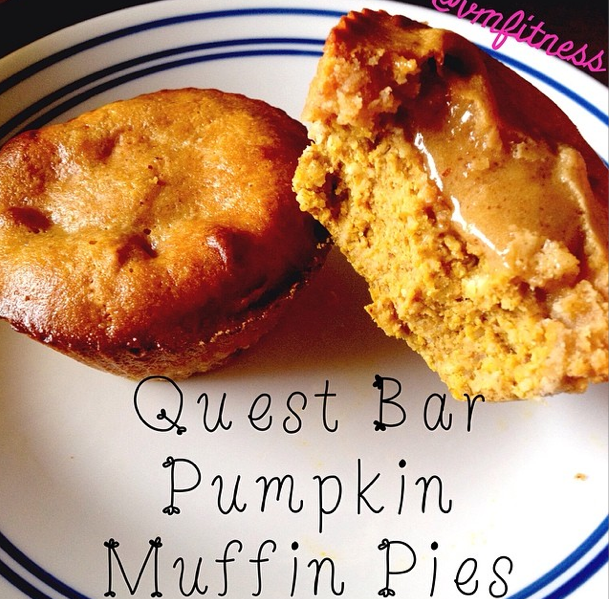 Check out my recipes that I have so far incorporating Quest bars here! 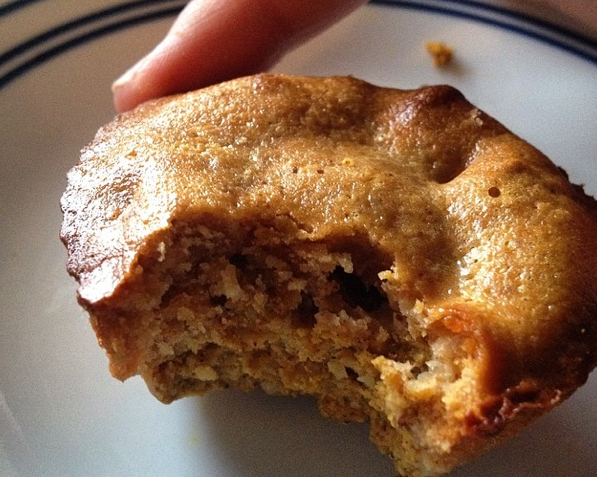 Check out my newest one, Pumpkin Pie Muffins with a Quest Bar Crunchy Crust! TO DIE FOR!!! Click more to see the recipe, anddd for a review on the newest healthy low calorie ice cream, HALO TOP CREAMERY! You know whenever there's a treat out there "healthified", I gotta try it! I contacted the people over at Halo Top and they were nice enough to send 4 flavors for me to sample! Strawberry, Lemon, Vanilla Bean, and Chocolate! Here's what the company claims! And when they said ridiculously good, they were NOT kidding. When I first got the "over-nighted" package on my doorstep, I was soooo excited! I immediately took them out, let them sit out a bit (they recommend doing this because they tend to freeze harder because of the ingredients and the fact that they don't put as much sugar in it!) and took a spoonful of each flavor to try them out! They were all sooo true to their flavors! I expected them at first to taste nasty, healthy, and overall... like "healthy" food... no real flavor, etc etc. But I was SO wrong. The strawberry tasted sweet and had a wonderful strawberry taste, the lemon was tart and sour, the vanilla bean tasted just like every other vanilla bean out there, but with less fat, carbs, and calories, and added protein, and the chocolate was spot on melt in your mouth fudgy chocolate flavor! 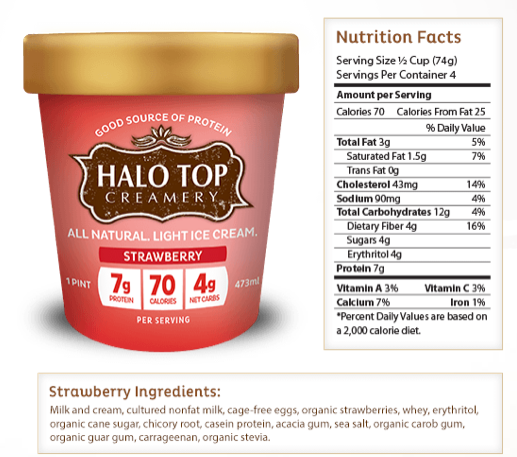 Check out the nutrition facts and ingredients! IT'S INSANEEEE! If you want to see if they sell in stores near you, check them out at their site! You will most definitely NOT regret trying it! Thanks so much Halo Top for letting me sample your amazingggg ice creams! - 3 cinnamon roll questbars + 6 tsp water. - microwave for 15-20 seconds, and using a spoon, mix WELLL until like a thick syrup!! Have oven preheated at 350 F. Spray silicone cooking cups with some oil to prevent sticking. Then pour your quest thick syrup over the tops of each pumpkin muffin batter. Bake for 15 minutes. Let cool before removing from silicone cups. ENJOY THE CRUNCHY quest crust GOODNESS!